More energy is produced from the sun in one hour than mankind uses in one year! So we’ve grabbed some of it…. Photo-voltaic panels on roof use sunlight to create electricity. 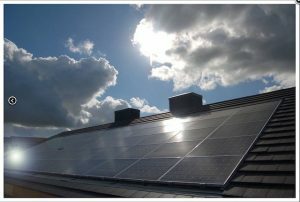 This provides energy for the Centre, and surplus is sold back to the Grid through the Government’s ‘Feed-In-Tariff’ scheme. Solar water heating panels on roof transfer the sun’s heat to pipes which then store hot water to provide for all hot water needs within the Centre. Mustn’t let that heat get away! Natural ventilation replaces air conditioning, the warm air rises through the outlets, with dampers closing them off as necessary. Glued, laminated timber beams support the new Hall ceiling, manufactured from smaller pieces of timber from managed forests to produce a strong beam. They took one sixth of the energy needed to produce a similar steel beam. These ‘Passive Infra Red’ sensors detect movement through temperature changes, and can be used to switch on lights only when needed. Outside surfaces are ‘porous’ where possible and absorb run-off water. This part of the roof has been planted with house leeks (Sedum species) to collect rainwater, provide insulation and noise abatement. Run-off from the roof, along with other ‘grey’ water from showers, basins, washing machines in the Centre, is collected in an underground tank (13). This non-drinking water can be used for watering allotments and wherever else is necessary in the wildlife-friendly surroundings. Eventually there will be a screen of climbing plants on the pergola to give shade in summer and a wind-break in winter, helping to save energy as well as providing a pleasant amenity for people and shelter for wildlife. The rainwater tank buried underground. This cutting edge technology enables natural gas to be converted into electricity, using a fuel cell, at a ratio of 1:4. The landscaping of the surrounding site area of course has had to be left to the last. A grant has been awarded from the BIG Lottery’s ‘Community Spaces’ to develop the site which will give opportunities for children and adults to use it for relaxation and environmental education, with trees, a playground, and wildlife friendly planting. The whole building and its surroundings will show how you can save energy, reduce carbon emissions and save money into the bargain! Madeley Centre is committed to the adoption of environmentally responsible policies and practices, and will comply with all environmental legislation. We will address climate change and the loss of life-support services provided by the natural world by continually improving our own environmental performance, and encourage others to do the same. * Reduce our energy consumption and aim for a low carbon footprint. We will generate our own renewable energy and promote the production of energy from renewable sources which do not have an adverse effect on biodiversity. * Prevent pollution and minimise the volume of waste going to landfill by reducing our consumption, and supporting re-use and recycling by collecting and segregating materials. * Have a purchasing policy which sources goods and services locally; minimises packaging and pays due regard to the waste implications of the product’s end of life. We will also promote business with suppliers who attempt to minimise the impact of their activities on the environment. * Maximise biodiversity benefits within all our activities. * Minimise the mileage travelled by private car, through car sharing or through using public transport. * Keep our consumption of water as low as possible. * Foster a sense of environmental awareness and responsibility amongst all our staff, volunteers and members of the public. This policy will be reviewed annually and updated where it is thought appropriate to maintain the best possible environmental practice.